Lucie Brock-Broido embodies the myth of the Poet as someone separate, hiding in alcoves as a child and hiding in imagination as an adult. Yet the poems of *Stay, Illusion* connect with others, confess a need for touch if not for understanding. There’s an undercurrent of vulnerability that does not detract from their artfulness, but rather includes readers in the art. Although only one poem is dedicated to Brock-Broido’s late friend Liam Rector, he appears elsewhere, haunting the collection as in “Little Industry of Ghosts,” which concludes “Would that our Liam were living still.” But the speaker knows that he is not, making these poems a sort of tug-o-war between reality and wishful thinking. Brock-Broido’s poetry has always been transcendent, able to leap into the otherworldly at will. *Stay, Illusion* is not grounded, but it is human, dealing with hospitals and schools as easily as eels and celestial ladders. It begs rather than believes that illusions will stay, acknowledging all along the realities of our mortality: “Did I forget to mention that when you’re dead // You’re dead a long time.” In some ways, every poem of this collection is an elegy and, as such, contemplates the ever after with ferocious hope that it exists. Imitators of Brock-Broido are sometimes criticized for their non sequiturs, but every turn of this book feels intentional. Which is not to say that these poems are easy—oh no, these are poems at their most challenging best. The language careens without ever losing control. The Poet shows us the serious work that poetry can do. Disclaimer: Lucie was once my teacher, but this is still the best collection I’ve read this year (and it’s been a strong year for poetry thus far). National Book award nominee of 2013. Great title, and there's her own ghosts in it, principally her friend Liam. Language rich. Aphoristic, in places. Lyrical, sort of haunted and haunting. Still, I was not taken by many of the poems, as driven as they all seem to be by a similar aesthetic and tone and strategy. (Read during Day 2 of NaNoReadMo. )This book of poetry has to win the National Book Award. It has to, because I almost couldn't stand to read it. It is poems like this that convince me I will never be a writer! Even the obsession with death and loss couldn't steer me away from these poems. You have to see for yourself. One of my favorites is online at Poets.org - A Meadow. Start there!A little blurb from A Meadow:"He might have beenHalf-beautiful in a certain optic nerveOf light, but legible only at particularLess snowy distances. "Other favorite poems included:For a Clouded Leopard in Another LifeExtreme Wisteria ("Intimacy with others, sateen. Exreme hyacinth as evidence. Her single subject the idea that every single thing she loves will (perhaps tomorrow) die. ")Moon River("Unhitched to anything,I forgive you - everything.Besides,You've always been such an odd uncanny half-genet of a man. ")We Have Always Live in the Castle (named after Shirley Jackson's novel)("It was always autumn in the paraphernalia of my laudanums....")Cave Painting of a Dun Horse("I had dreams that were inhumane to me.The smaller the light to write to becomes, the moreI have to say to you. ")A Cage Goes in Search of a BirdOf course, these are all segments, and the poems are best in their entireties. I picked this up because the cover is so, so pretty. This is also a great title for a book of poetry, really. But especially for this collection. You know that it is haunted by so many things. I ended up liking this a lot. She is a very lyrical poet. I loved her attention to sound, and her language is lush. Sometimes her poems are impenetrable in this collection and I just felt around the edges. That irritates me, but when I let that go then I enjoyed myself, the indecipherable movements I got. And, sometimes I went in brain first and ended up drawing my breath. There is a dark, sad undercurrent of loss and despair here, a desperation to make the illusions and past memories stay. Favorites: A MeadowIn this district of late/ Last light, indicated by the hour/ Of the beauty of his neck,...Three: he did not find my empathy/ Supernatural, at the very least!When I saw this spectacle, I wanted to live for/ A moment for a moment. However inelegant it was,/ It was what it might have been to be alive, but tenderly./ One thing. One thing. One thing:/ Tell me there is/ A meadow, afterward.You Have Harnessed Yourself Ridiculously To This WorldOf Tookie WilliamsFor A Clouded Leopard In Another LifeIn April, a tiny feline on the ledges of a billow cloud,/ Or like a finch let loose in the mossery, you were ended/ Unexpectedly; what is only left of you is me.Contributor's NoteHumane Farmingoh my god, this poem, just go find it. :Clip-winged, unbeaked,/ Take refuge by the heat, the scald of thought, made most magical/ For those, in dark, who find their own way by the light of others' eyes. UghhhhhhhhSilentiumGreat Reckoning in a Little RoomYes, I am dissembling.When I say yes, the streetlamp's cylinder of light will come into the room./ It is the last light you will ever stand inside the perfect circle of./ Swallow swallow, deep as the skirts of lingonberries brambling in a blacker forest/ And shallow, shallow, you will lay you down.Death, XXLWe Have Always Lived In The CastleOf my own venatic arts, everything I have ever killed had never been alive. /I'm not bored yet./ And all the dark I did is done. A bit about how I came to pick-up Lucie Brock-Broido's latest: It's been a year of screaming dullness for me. It began with a friend - the talented, too talented and too romantic and too everything kind, dying for reasons very much connected to his twin afflictions of talent and romance. This was the second time I'd seen this happen in as many years and the repetition compounded the message: That vision isn't just seeing, it's finding a way to survive all you've seen.In any event, my talented friends kept dying or destroying themselves, while I, way less talented and far more terrified, spent the year trying to play by the rules for once. I fought for a dull job and even the fight was dull. I wrapped myself in the things that comforted me and I tried my hand at being a responsible adult.A younger me would have become bored and rejected this year as stasis and stagnation. Lucky for me, I'm older. This year was healing. I learned, and probably still am learning, what my limits are. I used to believe that limits were things imposed by others, rules to be broken. They can be that, but more importantly, limits are the boundaries you define; what you will accept and reject, what is recognizably you (to you) and what, even when imposed on you by others, needs rejection.Which is a long way of getting to the heart of "Stay, Illusion." After a year of reading serious and practical things, I needed some poetry and a chance recommendation led me to this collection, which, like all the best writing, spoke directly to me and my situation. These are poems about limits (private gardens, prisons and isolated homes figure prominently) and how we define them externally through language and internally through our sense of self intersecting with our sense of those around us, our histories (both private and shared) and with the world-at-large. It's not poetry that moralizes, but rather poetry that explores the ambiguity of life with a clear-eyed and tender voice.It's also some damn fine writing. Even if you don't like poetry, give it a shot. Extreme Wisteria On abandon, uncalled for but called forth.The hydrangea of her crushed each year a little more into the attar of herself.Pallid. Injured. Wild in ecstasy. A throat to come home to, tupelo. Lemurs in parlors, inconsolable.Parlors of burgundy and sleigh. Unseverable fear.Case history: wistful, woke most every afternoon In the green rooms of the Abandonarium. Beautiful cage, asylum in.Reckless urges to climb celestial trellises that may or may not have been there.So few wild raspberries, they were countable and triaged out by hand.Ten-thousand-count Egyptian cotton sheets. Intimacy with others, sateen. Extreme hyacinth as evidence.Her single subject the idea that every single thing she loves Will (perhaps tomorrow) die.High editorial illusion of “control.” Early childhood: measles, scarlet fevers.Cleopatra for most masquerades, gold sandals, broken home;Convinced Gould’s late last recording of the Goldberg Variations was for her.Unusual coalition of early deaths.Early middle deaths as well. Believed, despite all evidence,In afterlife, looked hopelessly for corroborating evidence of such. Wisteria, extreme.There was always the murmur, you remember, about going home. The title of Brock-Broido's book is perfect. Taken from Horatio's exhortation to King Hamlet's ghost to remain a few moments longer and explain himself, prove his existence, keep the watchers company a few, fleeting seconds longer, it embodies the thrust Brock-Broido's poems wonderfully.There is so much magic and these lines, literal meaning always just out of reach. Brock-Broido is a master of the surprising turn of phrase, and these appear on almost every page of the book "Each child still has one lantern inside lit. May the Mother not/Blow her children out. She says her hair is thinning, thin./The flowerbed is black, sumptuous in emptiness." Language is the thing that saves us and the world, as Brock-Broido says, "If it is written down, you can't rescind it." Or more imagistically, here: "Now the Eskimos are frightened at the robins in their weirdly warming/Village because their language has no word for robin--not quite yet." Indeed, we only understand, we only love that which we can name.One note...towards the end of this collection, I did become a bit fatigued by the sort of gauze that enwraps these poems. I was never sure where things were going or where the floor was. This was taxing after a while. Hence the four stars rather than five. Some of my favorite authors like Paul Auster, Don DeLillo and Thomas Pynchon get so far out there that the narrative, plot, character development, message, storyline and what have you get lost. Either that or I am truly a dolt and miss the forest from the trees. Unfortunately, when it came to this National Book Award nominee for poetry, one of those two things happened. My ego tells me to think it was the former and, thus, the poet's fault while my conscience tells me it is more likely the latter and, thus, my fault. Yep. I should've paid more attention during the poetry section and lectures of Father Cicconolfi's English Lit. class at Gonzaga. I am confident the good Jesuit would not be pleased at me right now.Would I recommend reading this book of poetry? Yes, of course, if you like a shot of truly imaginative work or magical realism. If you prefer your poetry a bit more "meat and potatoes" and nothing fancy, then you may want to take a pass on this one.Sorry Ms. Lucie Brock-Broifo but I am just too damn dumb for your outstanding poetry. Incidentally, my forthcoming album shares its title with this book. We both like Hamlet.Words I learned from this book: trilobite, tamp, portière, retinue, tourniquet, venatic, syrinx, wold, castrato, sejant, besotted, seersucker, capuchin, grok, pram, vocable (n.), fetlock, hillock, neurasthenic, escutcheon, civet, natter, mummery, curlew, cortège, sacrarium, budgerigar, Hindemith, trammel, batiste, crinoline, Ashkenazi, abbatoir*, bitumen, bowered, physiognomy, dementia praecox, Trakl, barberry, coquettish, poplin, curry (v.), bower, odalisque, dirndl, boy-weed, excelsior, pinafore, linsey-woolsey, Bokhara, harrier, attar, sateen, ersatz, irides, conjunctivae, glossolalia. *(sic - I wonder if it isn't her own modification of "abattoir," as flavored by either "abba" or "abbot. ")Also, kinds of berries that appear in this book: chinaberry, thimbleberry, barberry, raspberry (twice), lingonberry, black cherry*, *not a berry? though who cares because strawberries aren't technically berries while pumpkins and avocados are4 and a half stars. Good job Lucie! 'The smaller the light to write to becomes, the more / I have to say to you.' 'Lie here with me in snow.' This collection feels heavy, winsome, intelligent, like a mosaic, sometimes incomprehensible - all of which are ok by me. There are more than a handful of poems here I look forward to returning to (especially 'For a Snow Leopard in October'). Also I think you'll have to agree that the author photo is nothing short of epic. Some themes: dead father, animals, darkness/light, middle of the country, found notes - each section seems to have recurring motifs, which make the collection even more interesting. Standout lines, to me: "The less the light the more the discontent in the dark." -- "On Having Contracted the Habit of Believing in the Interior World""Until you sever the thing, from self, it feels./Thereafter it belongs to none." -- "Bird, Singing""Your licensed massage therapist/Loves you more concretely than I do. I, abstract, adoring, distant/And unsalvageable. She said, Give up, be palpable--all Hand." -- "The Pianist"Lovely, high-vocabulary poems with lots of "air." Recurring motifs: lungs, Jewish communities, snow leopards, horses. Vibrantly musical, the language casts a spell. You'll leave this book feeling awakened, as if you're seeing the world for the first time. The poem "Freedom of Speech" was probably my favorite in the book: "I adore you more. I know / the wingspan of your voice." 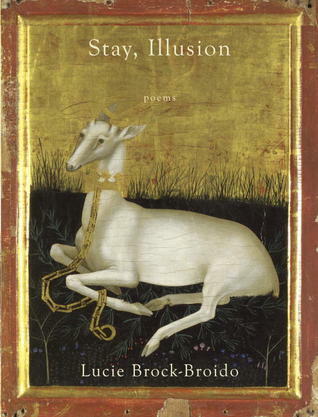 This is the first book of Lucie Brock-Broido's I've read, and her ability with language is nothing short of magical. Read this book! 4.5 stars, really—many of the poems in this volume are absolutely breathtaking. The interior monologues and weird language is really effective in those poems, but in a few others, it feels cloying and distracting. If I dreamt of lyric with a penchant for geographical turns, it would aspire to this work. Every line sings. Every poem probes. But not too deep. Don't unsettle things except in the slightest of lines: "My little gun's a Lady one. I just want to feel secure." Lucie Brock-Broido is practically my dream poet. Intricate, opulent, tactile, spooky, slippery, her hair's insane. Maybe this isn't her best but it's pretty magical. Gorgeous. Romantic. Look, I can't convey its beauty, what do I look like, an actual book reviewer? This was a good collection because of the interplay between reality and the mythic lives. Some poems are difficult and require another reading later this winter. Sorry, but this academic type of poetry is not my kind of poetry. While in earlier books I couldn't relate enough to her mythical, illusory world, in "Stay, Illusion" I enjoyed my stay. Evocative language, staggering lines, high-minded. Questions rise from statements, and questions are statements. This is a masterful work by one of today's greatest living poets. Lucid, playful, brutal, illuminated--contemporary lyric poetry at its very, very best. The poetry These are what poetry is, an essential, slowly catenated and they will. Throat. Small bricks. Shaft. Broken whole. I will never write poems. Come screaming. I know she's famous. I even met her at a reading. I know she's won awards and she's considered genius by some. But, I just don't appreciate this type of poetry. I don't like abstractions and I don't like just listening to language or words for the sake of them. I like concrete poetry; I like it when my senses see/taste/hear/smell what is going on. I felt too much adrift. She has a fantastic vocabulary and her poetry is musical, but this just isn't my cup of tea. I would likely appreciate this a lot more if I knew what she was saying and worked to analyze it with a PhD, and it's not to say I don't enjoy working to understand things, but I don't like being set adrift and being lost. I love Billy Collins instead. I found the first section of this book to be a bit off-putting. It seemed too closed, and merely like an assembly of disconnected lines.As the book went on, either the poems got better, or I got more accustomed to reading them, but I began to like it more. I ended up liking the collection very much.I find her images odd, but interesting. The language is beautiful. I enjoyed how images and ideas recurred throughout the poems.I look forward to rereading some of these poems in the coming days. Reviews for poetry are hard. When you consider the craft of it all, of putting together these combinations of words and images and thoughts, how can you not want to give everything five stars (excepting, of course, anything that begins with "There once was a man from Nantucket...")? But I also have to take into account how much I enjoyed it, how much each poem spoke to me, and, quite honestly, these poems were like tiny, little exquisite formations of nonsense. At least for me, there wasn't any there there. I don't know -- maybe I'm just not that deep. After reading each poem twice I joined her in her world, it expanded my experience. Discovered her playfulness and surprises. Came to love the textures, and textiles, as a theme. And then I re-read the book with pleasure. Duets well with Eros the Bittersweet. gaudy, sad, haunted by ghosts; I loved it. Lucie Brock-Broido - Lucie Brock-Broido is the author of three collections of poetry. She has received many honors, including the Witter-Bynner prize of Poetry from the American Academy of Arts and Letters, the Harvard Phi Beta Kappa Teaching Award, the Harvard-Danforth Award for Distinction in Teaching, the Jerome J. Shestack Poetry Prize from American Poetry Review, two National Endowment for the Arts fellowships, and a Guggenheim fellowship. She was described as an Elliptical Poet by critic Stephen Burt.Brock-Broido is currently Director of Poetry in the Writing Division at Columbia University in New York City.